If your question has not been answered, please contact Broadway at the Hobby Center Customer Service so that we may speak with you personally. Where do I go to get general information such as directions to the theater, parking information, box office hours, and other services offered by Broadway at the Hobby Center? The Hobby Center box office is open Monday through Friday from 10am to 6pm and Saturday and Sunday from 11am to 4pm. On event nights the box office will be open through intermission. We understand emergencies arise. Please contact the Hobby Center at 713.315.2525 and select option #4 (Mon-Fri, 10am -6pm and 11am-4pm, Sat-Sun and through intermission on event nights) to see how we can assist you. How does parking work at the Hobby Center? Do you have valet parking? Detailed self and valet parking information may be found here. Valet and Hobby Center garage parking is subject to availability. Large attendance at various performances may create high demand limiting access, and resulting in the closing of valet and/or self-parking prior to the start time of a performance. For your safety and security, all bags are subject to inspection before entering the theater. Please allow extra time prior to your performance. Over-sized bags, luggage and backpacks may not be permitted inside the venue. Walkthrough metal detectors are also used as part of this security check. Patrons may be refused entry if they are in possession of prohibited items including, but not limited to: alcoholic beverages, illegal drugs, food, drinks, glass/plastic/metal containers, video recorders, audio recorders, laptops, laser pointers, backpacks, knives, mace, pepper spray, weapons of any type (including pocket knives), unauthorized noise makers, glitter, confetti, streamers, helium balloons, parcels or packages, inflatables, skateboards, hoverboards, selfie sticks, GoPros, or large bags of any kind. For the most up to date information, please visit the Hobby Center website here. Food and drinks are sold in the lobby before shows and during intermission. Outside food and drink is not permitted. Food and glass containers are not permitted inside the audience chamber. Drinks are allowed inside the audience chamber at the discretion of the show producer. What is the appropriate dress for attending a Broadway at the Hobby Center performance? There is no required dress for Broadway at the Hobby Center performances. Attire generally ranges from business causal to cocktail dresses and suits. How early should I arrive for the performance? When do the theater doors open? We recommend that you arrive at the venue at least one hour prior to the performance to allow plenty of time to park and get seated. Theater doors generally open for seating 30 minutes prior to the start of the show. Take a virtual tour of the Hobby Center here. For more information regarding the Hobby Center accessibility services please email access@thehobbycenter.org. Limited View seats generally have a partial view of the stage due to the viewing angle in the theater. Obstructed View seats have a partially blocked view of the stage due to objects such as columns, railings, or sound equipment. To inquire about Limited or Obstructed View seats, please call us at 800.952.6560 (Mon-Fri, 9am – 5pm). Lottery and rush ticket policies vary between productions and are announced closer to the show’s run date. Please follow us on Facebook and Twitter or call us at 800.952.6560 (Mon-Fri, 9am – 5pm) for more information. If an in-person lottery or rush has been announced, please note that seating is always subject to availability and cannot be guaranteed. On-sale dates vary by show, but most shows tend to go on sale 4-6 months before they come to town. The best way to be notified when shows go on sale is to join our eCLUB, which you may sign up for here. Where can I find information about all of the shows playing in Broadway at the Hobby Center such as runtimes, show schedules, age recommendations, and more? Please visit our Shows page here for general information about our upcoming productions. Accessible seating is available, over the phone at 800.982.ARTS (2787) or in person at the Hobby Center Box Office. A full list of accessible services for the venue may be found here. Please call our National eCLUB Service Line at 866.880.9572 (Mon – Fri, 9am – 5pm), or email us at SpecialServices@BroadwayAcrossAmerica.com. To update email preferences, please visit our email preference page here and submit the email address attached to your account. You will receive an email notification with more instructions. If your tickets were misplaced or destroyed and you purchased them through an authorized ticket source (Broadway at the Hobby Center eCLUB, the Hobby Center, Ticketmaster, or the Hobby Center box office), a record of your sales transaction exists and we could accommodate you. Please contact your point of purchase as soon as possible to verify your options for replacement tickets. 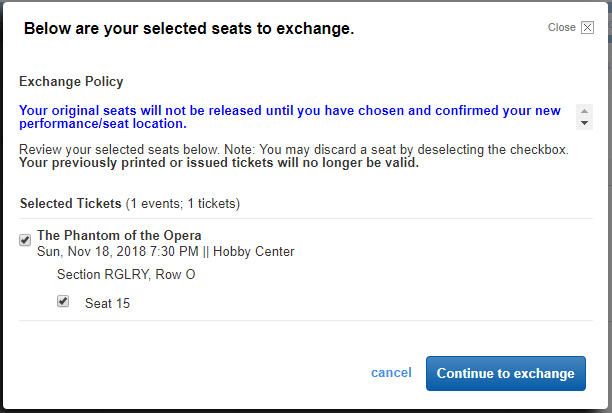 In the unlikely event that a performance is cancelled, Broadway at the Hobby Center and Ticketmaster.com will inform customers via phone, email, or mail with information regarding the ticketing policy. Ticket holders are encouraged to return to their original point of purchase for more information. In cases of inclement weather, we strongly recommend that patrons travel safely and allow plenty of time to arrive at the theater. During inclement weather, updates will be posted on our Facebook and Twitter pages and on the Broadway at the Hobby Center homepage. We advise all customers to contact their original point of sale. If you bought your tickets through the Broadway Across America eCLUB, you may call our national hotline at 866.880.9572 (Mon – Fri, 9am – 5pm) or email us at SpecialServices@BroadwayAcrossAmerica.com. You may also contact the Hobby Center directly here. What is your ticket policy for children? Broadway at the Hobby Center requires that every person, including infants and lap children, must have a ticket. Age recommendations vary by production. If you are receiving an error message, please call our National eCLUB Service Line at 866.880.9572 (Mon – Fri, 9am – 5pm) or email HoustonService@broadwayacrossamerica.com for assistance. If you have forgotten your password, click here to access the eCLUB login page. Click on “Forgot Password?” and enter the email address associated with your account. A temporary password will be emailed to you – click on the link provided in the email and enter your new password. If you do not have an account or password, or do not know the email address registered to your account, please contact our customer service hotline at 866.880.9572 (Mon – Fri, 9am – 5pm). New subscriptions will go onsale to the public in May. You can join our wait list for priority access here. 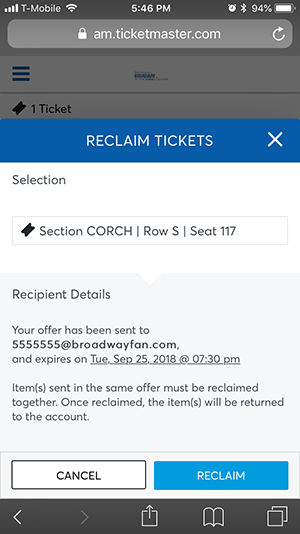 The price of each subscription seat reflects the face value of your tickets as well as $45 in processing fees, $35 and $40 in facility fees for the 7 and 8-show package, respectively, all applicable taxes, and, if applicable, the Premium Subscription Fee noted below. 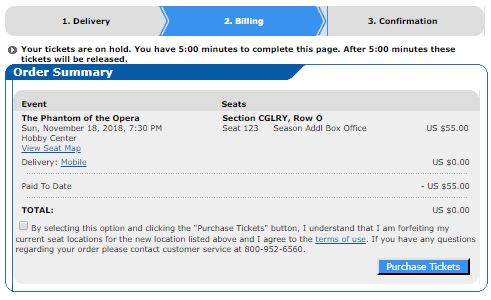 Premium subscriptions (Orchestra; Mezzanine A–G; Boxes 1–8) include an additional $125 fee for each seat purchased. New and renewing subscribers have the option to take part in our interest-free Payment Plan when buying a season ticket package! Opting into the Payment Plan splits the total price of your season package into multiple installments, which we automatically charge to your card at no additional cost. For more information, please call us at 800.952.6560 (Mon-Fri, 9am – 5pm). What is a Spotlight Subscriber? Spotlight Subscriber is an optional program that makes it easy to keep your seats year after year! When we announce the next season, you won’t need to take any action – we will automatically renew your same seats using the card on file. Spotlight Subscribers are still able to opt into our interest-free Payment Plan and will receive an invitation to participate in upgrades after the renewal period ends. If you would like to sign up, please call us at 800.952.6560 (Mon-Fri, 9am – 5pm). Please note – a valid email address is required to participate in our Spotlight Subscriber program. The 2019-2020 renewal deadline has passed, and your seats are being released for public sale. If you wish to continue to subscribe to our 2019-2020 Broadway season, please call us immediately at 800.952.6560 (M-F, 9am – 5pm). This is one of the best benefits of becoming a Broadway at the Hobby Center Season Subscriber! If you are unable to attend your scheduled performance, you may exchange into another performance of the same production. You may also exchange or upgrade into new seats for the same performance. All exchanges are subject to availability. Exchanges may be made by calling our Subscriber Hotline at 800.952.6560 (Mon-Fri, 9am to 5pm) or by logging into your online account here, or by going to the Hobby Center. Unfortunately, comparable seating cannot always be guaranteed. Tickets must be exchanged two business days before your regularly scheduled performance and by Friday at 5:00 pm for Sunday performances. The difference must be paid if exchanging into a higher priced performance or seat location. Your subscriber pricing, if applicable, will be honored if you exchange your tickets. However, when exchanging from a lower to a higher-priced performance or into premium seating, the price difference must be collected when processing the exchange. Exchanges may only be made for a different performance of the same show. Refunds from exchanging into a lower-priced ticket or performance will be processed within 7 business days. Please note: Ticket exchanges for Disney’s Aladdin must be completed no later than 72 hours prior to your performance. How do I exchange my tickets online? 1. Click HERE to log into your account or click MY ACCOUNT in the upper right hand corner. 2. Log into your account by entering an e-mail address and password. 3. Click MY TICKETS at the top of the dashboard, VIEW & MANAGE TICKETS in the Quick Links section, or one of your upcoming events displayed on the dashboard. 4. Click the box marked with an ellipsis and then EXCHANGE. 5. 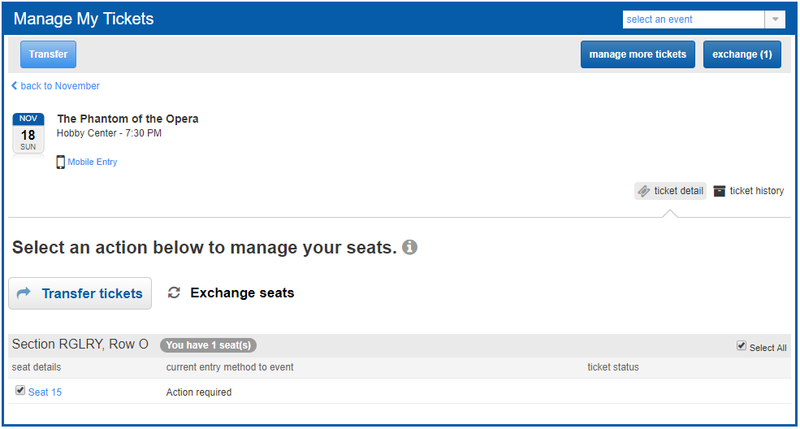 Check the box next to the SEAT LOCATION(S) you wish to exchange, then click the EXCHANGE button in the top right hand corner under MANAGE MY TICKETS. 6. Click CONTINUE TO EXCHANGE in the pop up window. 7. Select the new date you wish to attend the show and then click CONTINUE. 8. 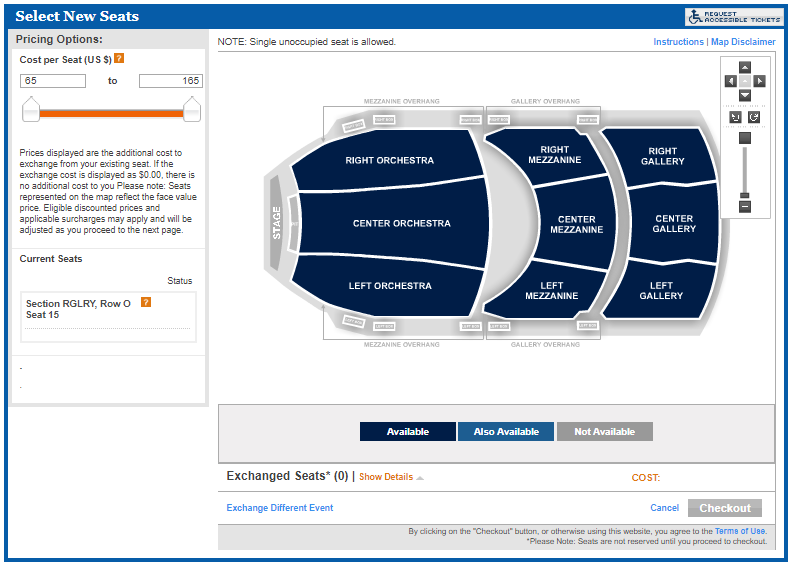 Use the seating chart, select your new seats, and click CHECKOUT. 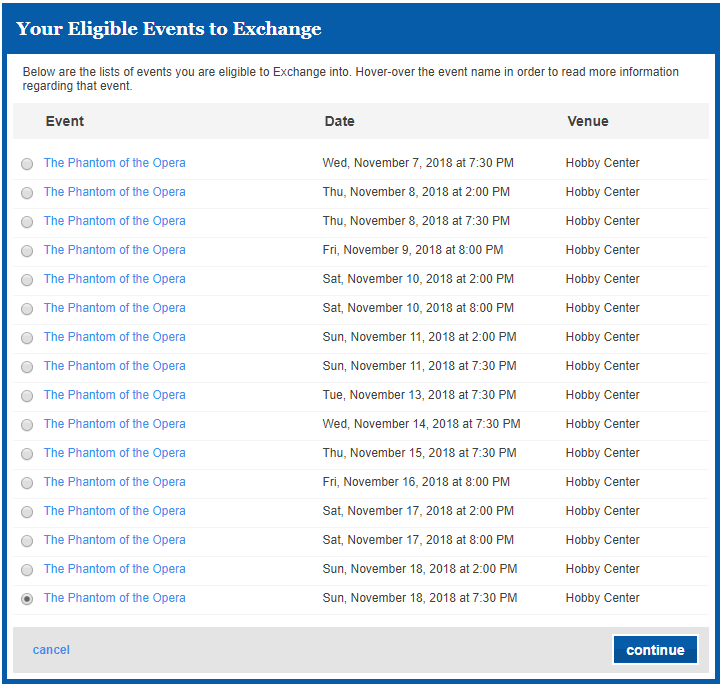 9. Review the details of your exchange, making sure to double check the new show’s date, time, seat location, and number of seats. 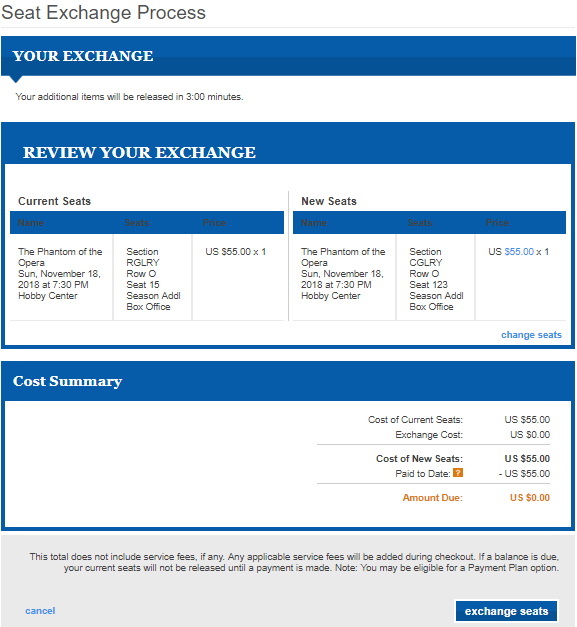 Once confirmed, click EXCHANGE SEATS to proceed to checkout. 10. Go through the checkout process to select your Delivery Method and Payment Type to complete the exchange. Your original seats will not be released until you click PURCHASE TICKETS. We apologize if there is a show in your season that you cannot make or have already seen; however, we are unable to offer you a refund on those tickets. Bear in mind that one of your subscriber benefits is the ability to exchange into another performance of the same show. You may also transfer your tickets to a friend or loved one for free by logging into your online account. If there is a show in another one of our markets that you would like to see, we may also be able to help through our City-to-City exchange program! Please note that all City-to-City exchanges must be completed at least two weeks prior to your original performance date. Please call 800.952.6560 (Mon-Fri, 9am – 5pm) for further information. How do I transfer my tickets online? 4. Click SEND in the event management screen. 5. Select the seat(s) you would like to transfer and click SEND. 6. Enter in the recipient’s information and click SEND. 7. You will be shown a confirmation screen of your transfer. 8. If you need to withdraw your transfer from a recipient, you can reclaim the tickets. Once additional tickets and exchanges become available for subscribers, you may add tickets online here, over the phone 800.952.6560 (Mon-Fri, 9am – 5pm), or in-person at the Hobby Center box office. Additional ticket orders for most shows in the 2018-2019 Season will be limited to 8. Orders that exceed this limit will be cancelled without notice, including multiple orders on the same account, billing address, or credit card. Additional tickets purchased by phone or online will incur a $10 service charge. This service charge may be waived by purchasing tickets in-person at the Hobby Center. Season Options/Specials are not part of the main package and are sold to subscribers on a first-come, first-serve basis, so we cannot guarantee your usual seats for them. Bear in mind that these shows may play for shorter runs or have different schedules than main package shows. 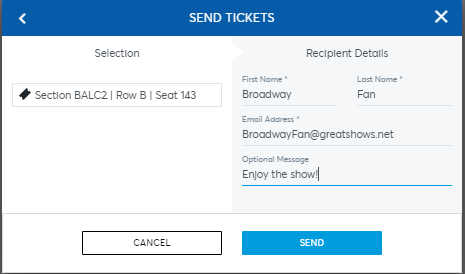 Broadway Across America makes ordering tickets for family, friends, and colleagues in a different city easy. Please call our subscriber hotline at 800.952.6560 (Mon-Fri, 9am – 5pm) and our representatives will be able to assist you with the purchase. For a list of cities within the Broadway Across America network visit BroadwayAcrossAmerica.com. We understand that emergencies happen. If an extenuating circumstance arose and you were unable to make the necessary exchange arrangements prior to the show, please contact Broadway at the Hobby Center as soon as possible at 800.952.6560 (Mon-Fri, 9am – 5pm). During the weekend, you can visit a representative at the Hobby Center Box Office. No refunds can be offered for past shows, and we will not be able to make accommodations after a show’s final performance. 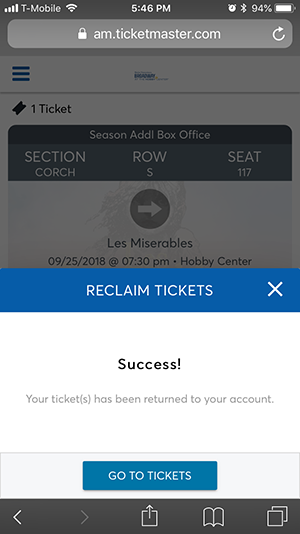 Where can I find information about mobile tickets? For details on accessing, downloading and sharing your mobile tickets, please visit here. For general FAQs about mobile ticketing, please visit here. If your subscription tickets have been misplaced or destroyed, contact Broadway at the Hobby Center at 800.952.6560 (Mon-Fri, 9am – 5pm) or HoustonService@broadwayacrossamerica.com as soon as possible to request a reprint. If you wish to purchase accessible seats for a subscription, please call us at 800.952.6560 (Mon-Fri, 9am – 5pm) a full list of accessible services for the venue may be found here. For additional accessibility questions or information, please email access@thehobbycenter.org. You may send this as an email to HoustonService@broadwayacrossamerica.com, or via standard mail to our office at Broadway at the Hobby Center, 729 7th Avenue, 6th Floor, New York, NY 10019. Please be sure to send transfer requests well before the renewal deadline! Once new accounts have been created only the new account holders will be able to manage their tickets. Please note: You may be asked to return the original tickets before a refund is issued. You must renew your current subscription before making any changes. If you are receiving an error message, please call us at 800.952.6560 (Mon-Fri, 9am – 5pm) or email HoustonService@broadwayacrossamerica.com for assistance. If you have forgotten your password, go to “Subscriptions” and then “Manage My Tickets.” Click on “Forgot Password?” and enter the email address associated with your account. A temporary password will be emailed to you – click on the link provided in the email and enter your new password. If you do not have an account or password, or do not know the email address registered to your account, please contact our customer service hotline at 800.952.6560 (Mon-Fri, 9am – 5pm). Our Mobile Alerts program lets you sign up to receive messages with us and be notified via text when emergencies happen or important dates arise. To sign up, please visit BroadwayAcrossAmerica.com/SMS. You may receive up to eight (8) messages per month. To stop receiving messages, participants can text “STOP” to 98693. Message and data rates may apply. For more information, please visit our Mobile FAQ page here. Many shows do offer a special rate to student and senior groups. Please call your group sales manager at 888.451.5986 (Mon-Fri, 10am-5pm) or email Houston.Groups@broadwayacrossamerica.com to discuss the various options available to your group. To fill out a group tickets request form or purchase from our Express Groups page, if available, click here. You may also contact our Group Sales department at 888.451.5986 (Mon-Fri, 10am-5pm). For our traditional group purchasers, when submitting a request form, you can specify a desired section and/or price level for your group. Group requests are filled on a first-come first-served basis from the best available inventory at the time of the order unless otherwise specified. 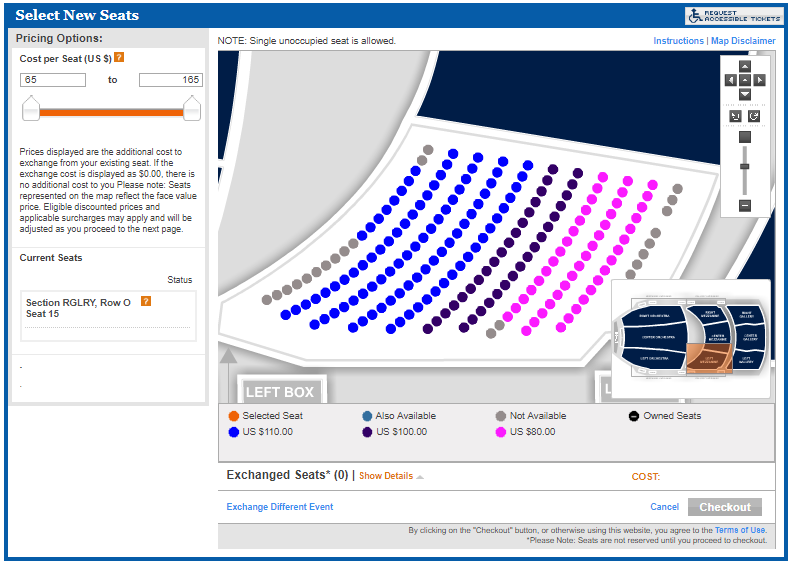 In order to accommodate your request, your group may need to spread throughout the theater in various rows, sections, and/or price levels. Payment dates on traditional group orders vary depending on the show and performance date. When you receive your group contract with your reserved seat locations, the payment date(s) will be included. If you would like to make your full payment earlier than the final due date, you are more than welcome. If you have any questions regarding payment dates, please contact your Group Sales Department at 888.451.5986 (Mon-Fri, 10am-5pm). If you would like to pay in person, we request that you call ahead to schedule an appointment. Please call us at 888.451.5986 (Mon-Fri, 10am-5pm). We aim to respond to all inquiries within 1-2 business days, but sometimes we experience a heavy volume of requests and it may take a little longer. If you have not received a response within a week, please call 888.451.5986 (Mon-Fri, 10am-5pm) or email Houston.Groups@broadwayacrossamerica.com to check the status of your order. If you have a promo code, visit the Groups Home page here and select “Buy Tickets” for the show you want to see. On the next screen, select “Find Tickets” next to your desired performance. 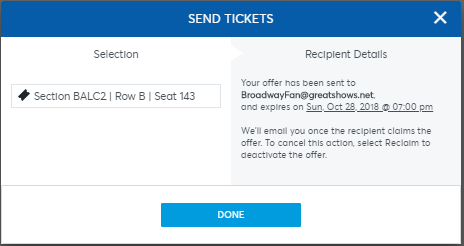 Enter your promo code in the pop-up box and hit “Go,” then select your seats! While Broadway Across America has many cities in its network, we are only able to help you with Group Sales in Houston. However, we’d be happy to put you in touch with our colleagues in other cities so you may book your group tickets. You’ll be sure to get the same great service from our colleagues as you have from us! For a full list of cities in our network, please visit www.BroadwayAcrossAmerica.com. If you are receiving an error message or having trouble with a Groups purchase or Promo Code, please call us at 888.451.5986 (Mon-Fri, 10am-5pm) or email Houston.Groups@broadwayacrossamerica.com for assistance.